Use the OneDrive for Business app in Windows 8 to store, access, and share work documents and other files in the cloud. To sign in to the OneDrive for Business app in Windows 8, enter your SharePoint or Office365 username and password and then select Sign In. To sign out of the app, select Settings>Options>Sign Out. Once you’re signed in, the OneDrive for Business app takes you directly to your files and folders. Tap or click any item to open it. Labels under each item tell you when it was last updated, and if it’s currently shared. To view the files you’ve opened most recently, select the down-arrow at the top of the page, and then select Recent Documents. Swipe up from the bottom of the screen or right-click any white space to show an action bar at the bottom of the screen. Browse to and select the files you want to upload. Files are added to the bottom action bar as you select them. Select Upload to OneDrive for Business. Browse to and select the folder you want to upload. Select Choose this folder > OK. In the other app, choose the command (such as Browse, Open, or Save As) to open or save a file. Tap or click the arrow to select the location of the file, and then choose OneDrive for Business from the list. When you select a file or folder in OneDrive for Business, an action bar appears at the bottom of the screen. To select a file in OneDrive for Business on a touchscreen, hold and swipe up or down on the file. If you’re in snap mode, hold and swipe left or right on the file. To select a file with a mouse, right-click it. Select the file you want to rename. Select Manage in the action bar. Enter a new name and then select Rename. Note: You can’t rename folders. To rename a folder, edit the folder properties in a browser. Select Delete again to confirm. Swipe up from the bottom of the screen or right-click any white space to show the action bar at the bottom of the screen. Enter a name and then select Create Folder. 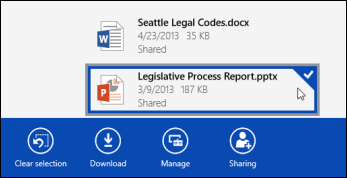 You can share files in your OneDrive for Business with people in your organization. Note: Sharing a file with someone outside your organization is only possible if your O365 tenant administrator has activated that feature. For more information see Share SharePoint files or folders in Office 365. Select Sharing in the action bar. If you’re already sharing the file, you see a list of the people sharing the file. Enter the email address of the person you want to share the file with in the Share with box. You can add several email addresses, separated with commas. You can also select the + icon to select people in your contact list. Set the sharing permission. The default setting is Let recipient edit. You can change sharing permissions later for each person you invite to share the file. People you’ve invited to share the file receive an email that contains a link to the file and the message, if you included one. Select the file for which you want to change sharing permissions. Select the name of the person whose permissions you want to change. Select the permission setting you want. Select the file you want to stop sharing. Select the name of the person you want to stop sharing the file with. You can download a copy of any OneDrive for Business file to your file system. You might do this if you want to be able to view a file when you’re offline. Select Download in the action bar. Browse to the folder in which you want to place the downloaded files and then select Choose this folder. 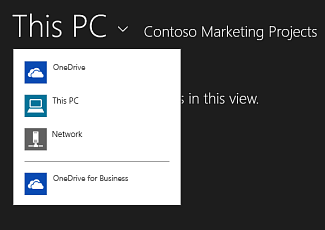 Note: If you also connect to OneDrive for Business in a web browser, you may be able to sync the OneDrive for Business library to your computer.